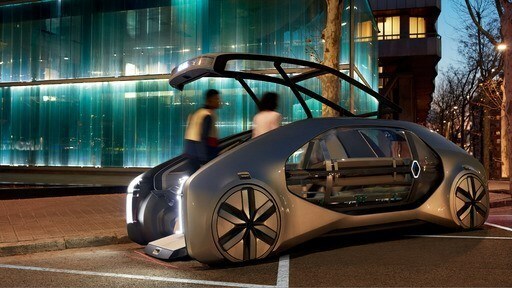 Renault has unveiled a new autonomous concept designed for small groups or individuals called the EZ-GO. The electric car would be available on demand  it could be hailed via an application or from stations positioned around a city. “Ride-hailing and shared mobility services represent an important opportunity for Renault, especially in cities. Many have aging or very young populations, and people looking for new mobility solutions,” said Thierry Bolloré, chief operating officer at Renault. EZ-GO is the first of a series of Renault concept cars focused on mobility services that will be unveiled during 2018. It follows the introduction of Renault’s electric, connected, Level 4 autonomous drive demo car for individual ownership, Symbioz. EZ-GO’s styling was designed to maximize the field of vision for the autonomous system’s sensors, and allow natural light through the panoramic glass roof. Once connected to its station, EZ-GO offers a wide flat floor flush with the boarding ramp, making it easy to get on board, whether walking or with wheels. The concept has Level 4 autonomous driving capability, which means it would be able to manage its distance from the vehicle in front, stay in lane, change lanes, and turn by itself at a junction. It could also move into a safe position in the case of exceptional incidents in its vicinity, either by itself or through its connectivity with a monitoring centre. Features designed to bolster safety include the car’s limited speed (50kmh/30mph); its wide front opening, which is away from the road; and the light marking the ground outside to indicate where the platform will land. 4Control, Renault’s four-wheel steering technology, is also employed for agility.